The following is from Inner Drive, a mental skills training company. The article is about performing under pressure and managing your nerves in competition. The article is written to help students with test anxiety as well as for athletes preparing for competition. Many of you are getting your athletes ready for their biggest competitions of the season. Thought this might be helpful. A student writing their exams share similarities with an athlete competing on match day. Both require the ability to perform under pressure. Both require turning months, if not years, of hard work into a one-off performance. Both can make people nervous. It is interesting to consider that the techniques used by students to manage nerves, can also be used by athletes. The context and situation may be different, but the strategies implemented to manage their emotions can be the same. 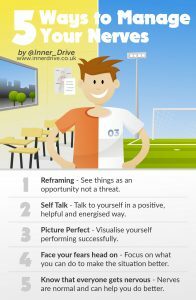 Self Talk – How you talk to yourself can have a huge impact on how you think, feel and perform. For example, asking yourself questions instead of saying statements (‘Will I do well?’ v ‘I will do well) has been found to help improve insight. It is thought that asking yourself questions is an effective technique when adopting new behaviours or when in unfamiliar situations. These sort of questions are especially helpful when developing metacognitive skills (a skill that we recommend all athletes develop and one that has also been proven to help disadvantaged students). Picture Perfect – Picturing yourself performing an upcoming task really well has been found to increase confidence. Spending just 15 minutes (which when you think about it, is just 1% of a day) imagining yourself successfully completing a task can help reduce any potential nerves. However, be careful. Too much time spent visualizing can quickly translate into too much time procrastinating. This blog looked at 7 ways to avoid procrastination. If you have already done the hard work, spending a few minutes picturing it going well should ensure you get all the psychological benefits, without any of the negative consequences of daydreaming the day away. Face your fears head on – Psychologists state that there are three type of coping strategies. Avoidance, Emotional and Problem Focused. Let’s say your car has run out of petrol. You could decide to never drive again (avoidance), or convince yourself that not being able to drive anywhere isn’t that bad (emotion focused) or you could go to the petrol station and fill up your tank (problem focused coping). The issue is that avoidant coping may offer short term relief, and emotional coping may make you feel a bit better, but problem-focused coping is the only option that addresses the problem head on. If you are nervous about an exam or a football match, then do something about it. Getting better at something is one of the most effective ways at improving your confidence. This will therefore help reduce your nerves about it. Reframing – How do you see an upcoming event; as a challenge or a threat? You are more likely to view an event as a threat if you a) focus on what it is you stand to lose, b) feel the situation demands too much from you and c) worry about looking bad. On the flipside, if you focus on what it is you stand to gain, feel you have the resources and skills necessary to meet the task and focus on mastery, then you are more likely to view the event as an opportunity. This differentiation can have a significant impact on how you think, feel and perform. There is some exciting research emanating from psychologists at Staffordshire University on this. You can read about their work here, and is something some of our future blogs are going to look at in more detail. Know that everyone gets nervous – The ‘Spotlight Effect’ describes how people tend to overestimate how much attention other people are paying them. You feel like all eyes are on you. This was demonstrated in a study that had students wear an embarrassing t-shirt to a lecture (for the record, the t-shirt that was chosen was one that just had Barry Manilow’s face on it). The participants predicted that 50% of the other students would notice the t-shirt. In reality, less than 25% did. A similar situation applies to nerves. It is easy to think that you are the only one who gets nervous. That these feelings are unique to you. That everyone is always calm and confident and they are judging you for being nervous. This could not be further from the truth. Every athlete gets nervous at some stage. Every student has moments of self-doubt. Remind yourself that these feelings are normal. They are natural. And they happen to everyone else as well.